In a bowl, mix the flour, egg, and milk. Season with cayenne pepper, seasoned salt, salt, and pepper. Mix in the conch meat, onion, bell pepper, celery, and garlic. In a bowl, mix the ketchup, lime juice, mayonnaise, hot sauce, salt, and pepper. Serve dipping sauce on the side with the fritters. Conch can be replaced with any seafood. 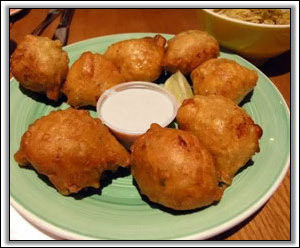 We tried last week ‘Calamari Fritters,” following the same recipe but replacing conch with chopped calamari… it turned out awesome! We cannot wait to try it with shrimp or crab meat.